Rhizoctonia Root Rot - Seedex, Inc.
Rhizoctonia is a serious problem in sugarbeet causing root and crown rot. While some fungicides are available to combat the disease, advances in plant breeding continue to provide the best chance of success against Rhizoctonia. 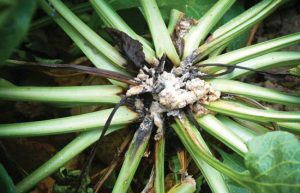 The fungus responsible for Rhizoctonia, Rhizoctonia solani, is common in sugarbeet in all countries where the crop is grown and climate, soil type and crop rotations make conditions favorable for its development. Progress in the development of better genetic tolerance to Rhizoctonia has been slow compared to other sugarbeet diseases like Rhizomania due to the complexity of its multi-gene structures and the difficulty in managing these structures with genetic markers. In addition, the source of the Rhizoctonia-resistant gene structure goes back to wild relatives of the sugarbeet. This means introducing resistant genetics has an adverse effect on many of the desireable characteristics of cultivated sugarbeets. To put it simply, Rhizoctonia-resistant varieties have yet to produce the same consistent yield and quality as conventional seed varieties. But there’s hope. Great strides continue to be made, thanks in part to research done in the United States. Seedex, Inc. is very proud of its key contributions to the development of Rhizomania-Rhizoctonia tolerant hybrids. These commercial varieties provide industry-leading solutions for most environments plagued with Rhizoctonia. Rhizoctonia root rot disease is caused by a soil fungus called Rhizoctonia solani. Infection typically occurs when contaminated soil is deposited onto the crown during cultivation or by water. Infected sugarbeets will develop a dark brown rot on the root and crown. Outbreaks generally begin in June when rows begin to canopy. However, symptoms of the disease are not apparent until the end of summer. Often times, a farmer will only become aware of the diseased crop during harvest. While Rhizoctonia has been diagnosed on sugarbeets since the mid-1970s, its presence was rare. Recently however, outbreaks have been more common, particularly in areas with heavy rotations of corn or beans. The strain specific to these crops, AG 2-2 IIIB, is widely distributed around the world and seen in all types of soil. Rhizoctonia root rot is the most common root rot in the United States. According to one study in 2003, the disease was present in approximately one-third of all sugarbeet growing areas. The fungus responsible for Rhizoctonia, Rhizoctonia solani, not only causes Rhizoctonia root rot, but is also a key part of a group of fungi responsible for damping off. Rhizoctonia solani carries two primary strains of infection. One strain, AG 2-2 IIIB, is responsible for Rhizoctonia root rot. The other, AG 4, aids the other fungi in damping off sugarbeets. Both strains may coexist in the same field meaning both damping off and root rot could occur successively. The other fungi involved in the complex that causes damping off are Phoma (Phoma betae), Pythium (Pythium ultimum) and Aphanomyces (Aphanomyces cochloides, which may also cause root rot). These fungi, in addition to Rhizoctonia solani, attack young plants at the same time, making it difficult to identify the pathogenic agent. Damping off causes the constriction of the beet crown and the blackening of roots in young plants (also called “black foot”). Sometimes, the part located under the cotyledons may also turn black. Unhealthy root structures make the plant extremely weak or kill it altogether. This fungi complex prefers warm, wet weather. Late sowing increases the risk of spreading the fungi complex. Black foot is widespread and devastating if not attended to quickly. Seed coatings have not been successful in minimizing the spread of the disease. Folian fungicides have some promise to minimize infection if applied at the optimum time. Without a host plant, Rhizoctonia solani dwells in the form of small, brown or black structures called “sclerotia” where it can survive for many years. Rhizoctonia solani can survive in soil for many years in the form of mycelium. When the soil reaches a favorable temperature (roughly 60º F), the host plant, in this case sugarbeets, begins to excrete chemicals. These secretions arouse the dormant sclerotia and the fungus begins to produce a mass of long filaments (hyphae). The hyphae extend through the soil until they make contact with the host plant. Once attached to the host plant, the mycelium proliferates on the root and produces T-shaped structures called “infection cushions.” Here the mycelium releases enzymes capable of dissolving cell walls. The mycelium then colonizes the intra- and inter-cell spaces of the root tissue. The fungus parasite begins to develop by feasting on the plant’s nutrients. Eventually, the fungus invades all the cells, killing them and reproducing survival structures (sclerotia) inside. The host plant dies as its xylem vessels are attacked, leaving these sclerotia behind in the soil. Soil compaction reduces drainage, creating a favorable environment for Rhizoctonia. Various strains of Rhizoctonia solani exist all over the world. AG 2-2 IIIB, the strain responsible for Rhizoctonia root rot, can be found in a broad array of host crops. Corn and beans are particularly susceptible to Rhizoctonia. This means crop rotation plays an important role in determining the possibility of a Rhizoctonia outbreak in the field. Note: There is a strain of Rhizoctonia solani that attacks potatoes. While outbreaks of Rhizoctonia occur early in the season during canopy closure, symptoms are not generally visible until late summer or early fall. At times, a farmer will not be aware of the infection until harvest. Rhizoctonia root rot infestation always appears as limited patches that spread along the rows. These small infected patches grow gradually. In extreme cases, entire rows or the whole field can be affected. What starts as a sudden wilting of the foliage gradually evolves into a chlorosis or complete necrosis of the leaves. The dead foliage remains attached to the crown of the sugarbeet, forming a brown rosette in the middle. New leaves may appear, however this is a sign the plant is near death. Damage in the roots and crown is defined by a dark, black or brown dry rot. It can be observed on the surface and/or below the crown depending on the severity of the outbreak. In some cases, the entire sugarbeet will disappear entirely. Diagnosing root rot is fairly easy due to the stark discoloration. However, Rhizoctonia may be confused with other root rots such as Pythium or Aphanomyces. Even lightning damage may resemble a Rhizoctonia outbreak. If uncertain of the particular affliction, growers should consult their Seedex dealer, an agriculturalist, or other specialist. 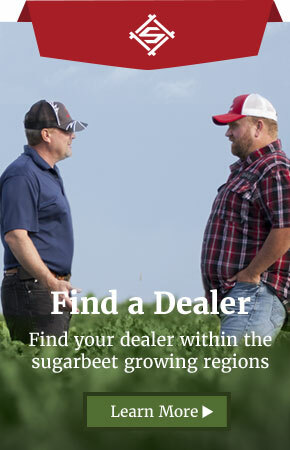 Rhizoctonia is present across all areas of the United States where sugarbeets are grown. The severity of an outbreak may vary considerably depending on a number of environmental conditions. Poor industrial quality due to increased levels of sodium, potassium, and nitrogen. Extend Rotation. A three to five year buffer between sugarbeet crops in the same field is ideal. Avoid susceptible crops. This means supplementing corn, beans and sugarbeet crops with non-host crops. Use caution cultivating as it can result in the spread of contaminated soil to the beet tops. Maintain good soil structure. Use appropriate fertilizers, sow a cover crop in the winter and avoid the use of heavy machinery in wet or unfavorable conditions. Minimize soil compaction. Use wide tires. The United States provides the primary source for Rhizoctonia resistance. It differs from Rhizomania resistance in that, it is controlled by a large number of genes rather than a single gene. The process of multi-gene management is also known as quantitative resistance. Production of Rhizoctonia and Rhizomania-resistant varieties requires several steps. First, pedigree plants, (those with high sugar content, good root yield, extractability, etc) are bred with wild species resistant to the disease. Next, the populations are “back-crossed” several times with the elite parent. Each generation is grown in a greenhouse with high levels of Rhizoctonia and Rhizomania pressure. The plants with the best results are harvested and prepared for the next step. Advances in genetic marking continue to enhance the success of the hybrids. 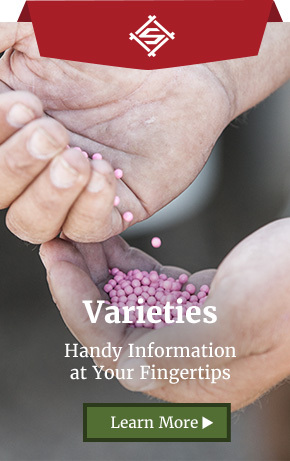 The primary challenge for breeders is to develop varieties that are not only highly resistant to Rhizoctonia and Rhizomania, but maintain the characteristics of quality plants (high sugar content, large yield, etc). A variety with Rhizoctonia-Rhizomania dual tolerance is an effective solution where Rhizoctonia root rot has been known to exist. Compared to varieties that only provide Rhizomania resistance, the dual tolerance performs much better in terms of yield, sugar content, soil tare, and extractability where Rhizoctonia pressure is high. For optimum results, dual tolerance varieties must be combined with proactive agronomic practices. They are susceptible to bolting. Rhizoctonia-Rhizomania resistance does not protect against the other fungi that cause damping off. 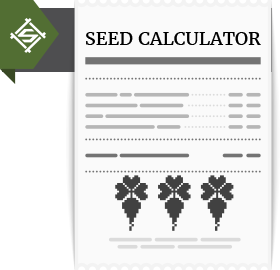 Nevertheless, dual tolerance varieties currently on the market continue to be a viable source of effective seed. Rhizoctonia root rot is caused by the soil fungus, Rhizoctonia solani. The disease causes a dark black or brown rot that envelops the root and crown of sugarbeets. Outbreaks occur in favorable conditions with abundant rainfall and high spring or summer temperatures. Poor soil structure consisting of tightly compacted soil increases the spread of the fungus. Infection typically occurs in the crown when contaminated soil is deposited onto the crown during cultivation or by wind or rain. The strain of Rhizoctonia solani that causes Rhizoctonia root rot is fairly common and can attack a wide range of hosts such as corn or beans. Planting these crops in rotation with sugarbeets greatly increases the risk of infection. Symptoms appear late in the growing season, spreading in patches or down the rows in the field. The damage is characterized by permanent wilting of the foliage and dark rot spots on the root or crown. In severe cases, Rhizoctonia root rot causes significant economic devastation through major losses in yield, reduction in sugar content, an increase in soil tare and poor industrial quality. Complete immunity from a Rhizoctonia outbreak is not possible, however several things can be done to minimize the risk of infection. In the United States, some fungicides are available to help combat the fungus. Growers should consult their agriculturalists and chemical representatives for more information on managing the disease after planting. Varieties with resistance to both Rhizoctonia and Rhizomania continue to provide growers a higher level of tolerance and the opportunity to grow this valuable crop. Seedex, Inc. is a leader in dual Rhizoctonia-Rhizomania tolerant varieties. These consistent Seedex varieties blend a high degree of resistance, excellent yield performance, and the strong emergence that Seedex is known for.